So, what is a king cake? The name “king cake” comes from the Biblical story of the three kings who bring gifts to Baby Jesus. 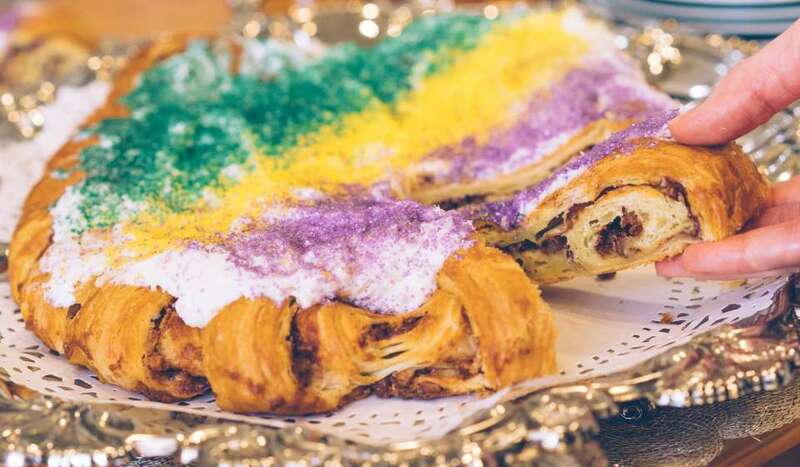 A blend of coffee cake and cinnamon roll, king cake is usually iced in yellow, green and purple – the colors of Mardi Gras -- and is frequently packed with fruit fillings and decadent cream cheeses. Hidden within these season sweets also lie a special surprise: a plastic king cake baby to continue the fun. What does the baby inside the king cake mean? Hidden in its interior, or under a slice, is a small plastic baby. Whoever finds it must either bring the next cake or throw a party, thus sparking an unending round of food and fun. 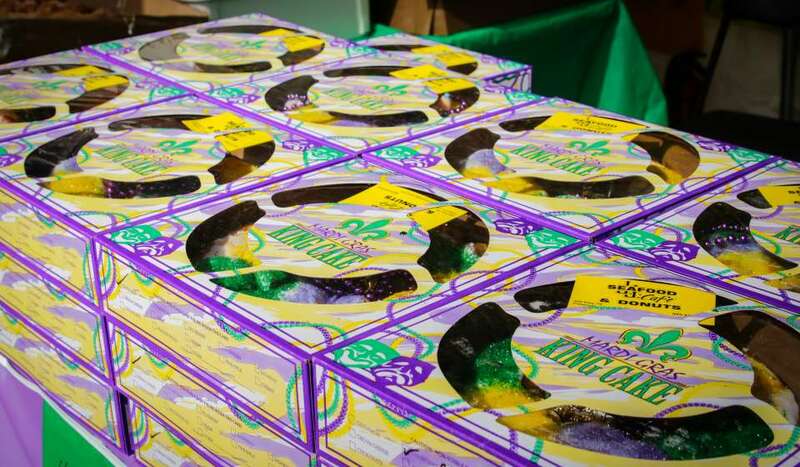 Whether at the workplace, school or home - king cake is a gift that keeps on giving throughout the Mardi Gras season. When do you eat king cake? 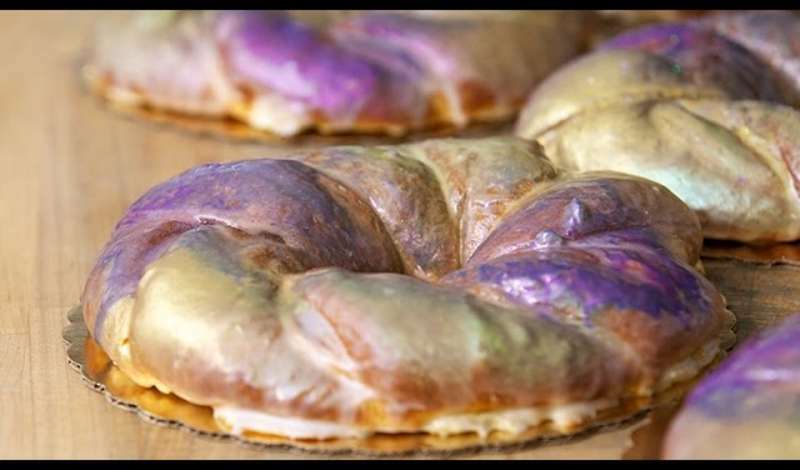 King cake is indeed a heavenly treat for New Orleanians when it appears in supermarkets and bakeries between early January and Ash Wednesday. Some bakeries across the city begin selling as early as December, but always at the start of Carnival - January 6. While we hold firm to our belief that king cakes taste best in New Orleans, don’t fret if you aren’t here during that special time of year. Several bakeries offer fast delivery anywhere in the United States. Where do I Buy a King Cake? New Orleans is filled with a number of bakeries, sweet shops and restaurants eager to begin sharing this sweet seasonal treat. 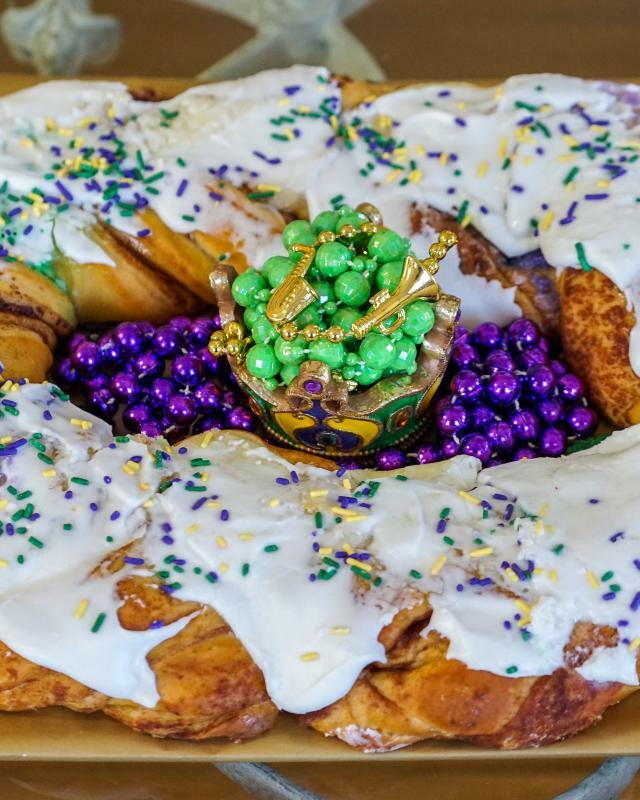 Enjoy customized, traditional and unique king cakes from across the city. Scroll down to the bottom of the page to see a list of bakeries that offer king cakes, or browse a this list of some of our favorite king cake spots. Can I Make King Cake at Home? Yes! You can definitely start a tradition of making your own king cakes at home with your loved ones. 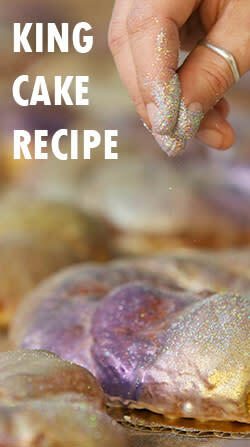 Check out Sucre’s award-winning king cake recipe for inspiration this Mardi Gras season. Voted "A Favorite" by the Times-Picayune King Cake Contest and "BEST" King Cake by a Washington Post blind taste test. Sucre&apos;s signature buttery danish pastry is sweetened by cinnamon and raw cane sugar then folded with a light layer of creole cream cheese. Combine flour, sugar, salt, yeast and milk in a mixing bowl and mix on low speed till it comes together. As dough comes together, add 1 egg at a time then add butter gradually. Continue to mix at medium speed till smooth and elastic. Do not overmix. Place in a clean bowl and wrap with plastic wrap, keep at room temperature and allow to double in size. When doubled, "punch down" to deflate, and wrap again to allow to rise again. At this point, make the cream cheese filling. Roll dough to an even rectangle about ¼" thick. Cut into 2 lengthwise and pipe or spoon cream cheese filling on the upper 1/3 of each piece. Sprinkle with cinnamon sugar (1/2 cup sugar + 1tablespoon cinnamon)evenly. Roll each piece into a log and twist them together to form a braid. Shape into a ring sealing the ends well. Proof to double in size and bake in preheated oven @360*F for approx 20-25 minutes or till golden brown on the bottom surface. If top is golden brown and bottom is still not baked, cover the top with foil and turn oven down to 325*F. Allow to cool before glazing. Mix all ingredients till smooth and coat top of cooled cake. Allow glaze to dry before serving.